Secure content platforms that transform the way you share, manage and collaborate on your most valuable corporate information. Designed without compromise between security and ease-of-use, these platforms allow every employee to securely work across teams, with customers and with partners, on any device, anywhere. Adopting a secure content platform will help you keep sensitive documents out of email and away from insecure consumer services. Smarter.ECM combines the features of Box and Qlik to offer the perfect analysis and governance framework for Box within your enterprise. 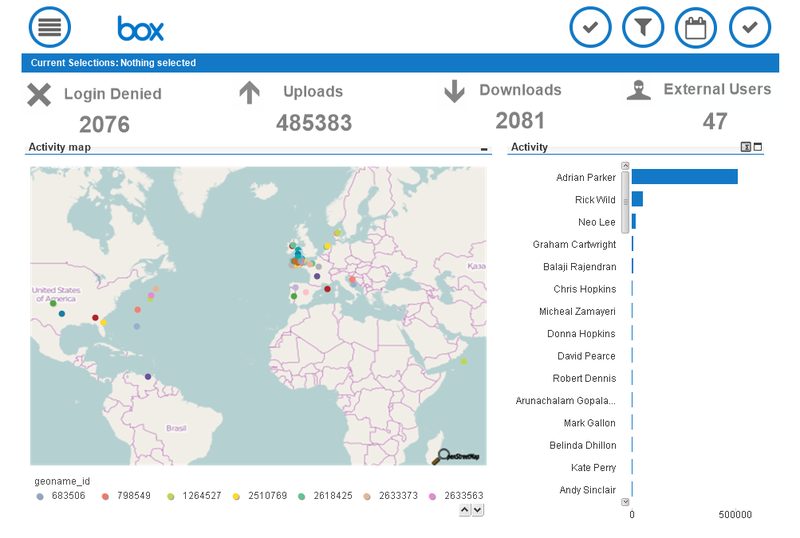 The dashboard utilises Qliks unique associative analytic platform to reveal patterns in your Box usage data, Smarter.ECM for Box gives unrivalled audit capabilities over your Box installation. Analysing the metadata of your content allows smarter content management, for example revealing duplicate copies of documents, or highlighting where documents are missing in an expected process sequence. Smarter.ECM is the dashboard solution for ECM managers, addressing their need to report on company documents and activity, on an accurate, timely basis. With clear reporting, from a governance perspective. Smarter.ECM for Box combines the features of these advanced platforms to offer the perfect analysis and governance framework for Box within your enterprise. 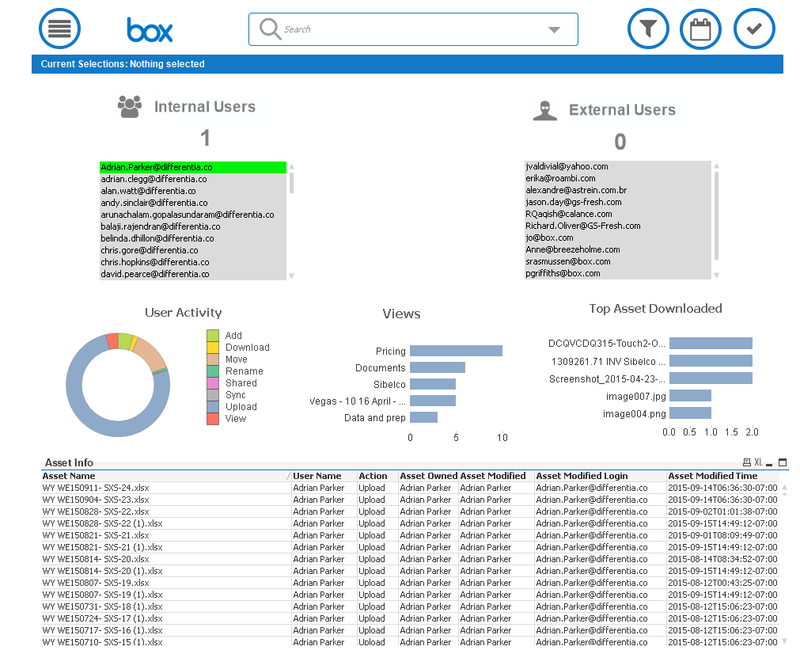 Utilising Qliks unique associative analytic platform to reveal patterns in your Box usage data, Smarter.ECM for Box gives unrivalled audit capabilities over your Box installation. Analysing the metadata of your content allows smarter content management, for example revealing duplicate copies of documents, or highlighting where documents are missing in an expected process sequence. 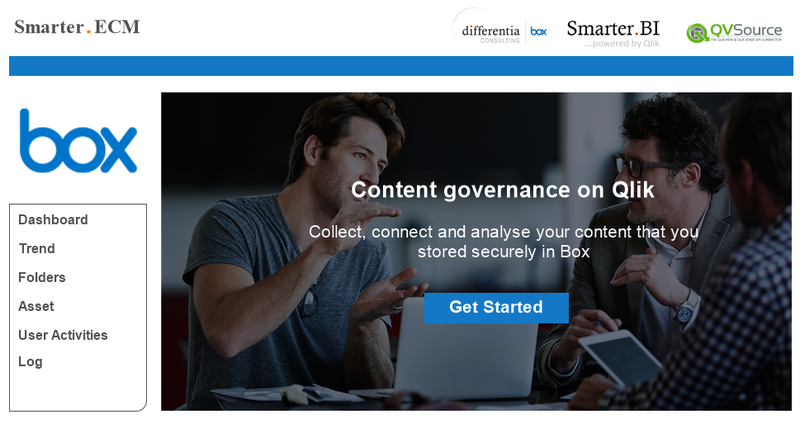 Smarter.ECM for Box lets you integrate Box usage and content data with your other business information for a comprehensive solution. Smarter.ECM provides complete information on the performance of your enterprises documents. It provides an audit trail and analytics to asset or document governance related activities. The application creates a single view of the way your enterprise documents are being accessed, by who where and when. In addition to document management it provides an audit trial on web content management, content workflow and a company’s entire assets. To understand how Smarter.ECM powered by the Qlik Analytics Platform can help your business get in touch today.